One of the things on my “must do while in Montana” list was go to a rodeo. I don’t think my sister-in-law, Karen, thinks of rodeos as a “Montana Must”, but I figured, it wasn’t something we could do in the east, so I wanted to take one in. 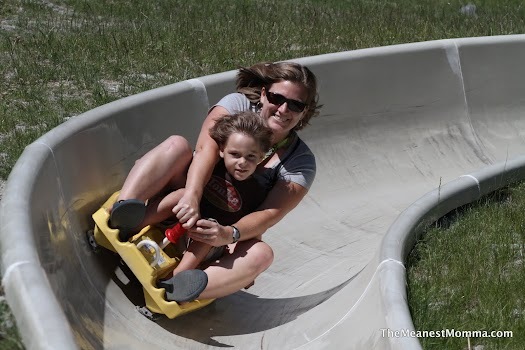 After scoping things out, I discovered our best bet would be to drive two hours to the small town of Libby, MT and check out the Kootenai River Rodeo. There wasn’t a lot of information about it online, but I had high hopes since it was a PRCA sanctioned event. The rodeo wasn’t until evening, so we spent the day checking out the town of Whitefish, MT and the nearby ski resort on Big Mountain. The town itself is very cute, full of fun little shops. It is also one of the few (only?) towns in Montana that has a sales tax! That tells you something about it’s touristy status. We wandered the street for a bit and checked out a few shops, but most all were too spendy for our budget. My real interest was in the Whitefish Mountain Resort. 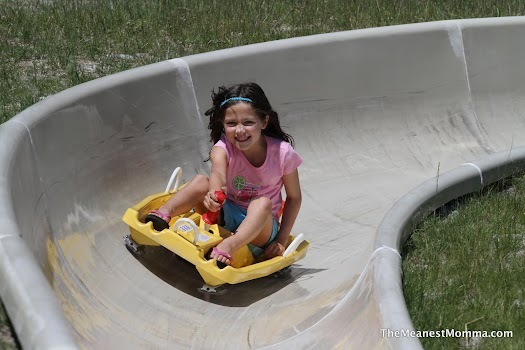 It is a winter ski resort that has fun summer offerings such as mountain biking, zip lining, and alpine slides. We rode alpine slides for the first time in New Hampshire, so I thought it would be fun to do it again. While the boys got to ride with us (for free). It cost $6/ride if you bought at least a 4 pack (otherwise $8), so we each did 2 runs. The track wasn’t as long as the one in NH, but we still had a great time. They had a photographer set up to take pictures, which is how we got these sweet shots. They sell the digital files so you can do what you want with them. On my first ride down (with Sam), I took a video of our ride. (You might want to turn down the volume, the wind noise is super annoying loud). 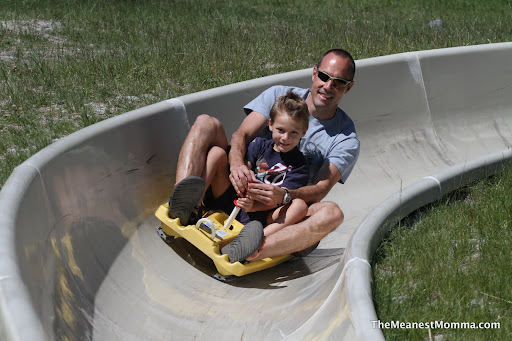 We enjoyed riding the chairlift up, as well as checking out the nature center in the lodge. They had a bunch of beautiful pelts (donated by a local trapper) of all different animals. Check out Wendy the Wolf. After a while, we caught an early dinner in Whitefish, then headed west to check out the rodeo! We got there just as the rodeo was starting. We squeezed into the crowded stands and settled in for the show. The events included: riding broncs, roping cattle, wrastling steer, women’s barrel racing, and the big ticket item: bull riding. The kids weren’t sure what to expect, but they (and I) loved it! Wendy felt bad for the cows. The skill of the cowboys and their horses was pretty impressive. The man on the raised platform (not inside the log press stand) was the announcer/MC. He did a great job giving info and background about each event and rider. The Rodeo “Clown” was a highlight for sure. His name was J.J., and according to his website, he is a Barrelman Extraordinaire. Clowns used to be responsible for distracting the bulls when the riders came off them, but now their job is more focused on entertaining the crowd in the lulls. And J.J. was definitely entertaining. One of the most fun things he did for the kids was he invited them all down to inside the ring to participate in a Boot Race. Each kid put one shoe in the middle and then returned to the fence. When JJ said “Go!” everyone ran to retrieve their shoe and race back to the fence. Except this guy, he preferred to spectate. Here’s a video clip of the Boot Race in action. In addition to all the rodeo fun, we enjoyed the yummy junk food you’d find at a rodeo or fair. Like Sno Cones. Montanore Minerals was one of the title sponsors and brought out a big underground digger at one point. I’m not sure who they are, but they were working pretty hard to win some community goodwill. We scored some rodeo swag in the form of MM hats and t-shirts. Finally, it was time for the last event of the rodeo and what we’d been waiting for — Bull Riding! It was pretty late at that point, so my camera pictures are poor quality, but it was a lot of fun to watch. Most of the contestants couldn’t last 8 seconds, but this guy did! At the end of the rodeo they let all the horses (the broncs, I think?) run free in the ring. They were beautiful to watch. It was a late night and we came home exhausted but I was so glad we got to experience a Montana Rodeo. I expect the kids remember the cotton candy, snow cone, and kettle corn the best. Okay…I am so jealous. I want to go to a rodeo. And it doesn’t help much that my kids want to go to a rodeo, or that now I live someplace that rodeos are unheard of. SO FUN. That town? Super cute!